E2 elimination vs ring contraction: anti-periplanarity in action. One thing almost always leads to another in chemistry. In the last post, I described how an antiperiplanar migration could compete with an antiperiplanar elimination. This leads to the hydroboration-oxidation mechanism, the discovery of which resulted in Herbert C. Brown (at least in part) being awarded the Nobel prize in 1979. This reaction represents a fairly steep learning curve for new students of organic chemistry. Actually, it turns out its a pretty steep learning curve for most of us. Firstly, it is often described as an anti-Markovnikov reaction, with the hydroxyl group attaching to the less-substituted carbon (as above). Unfortunately, the mechanism is revealed as following Markovnikov, rather than being an anti example! Confusing? One possible way of representing the mechanism is to show the (nucleophilic) π-bond attacking the (electrophilic) boron centre of a BH3 molecule (itself presumed to be generated from a suitable reagent such as BH3.SMe2 in a pre-equilibrium step) to form a carbocation (step 1 above). The regiospecificity proceeds so as to form the most stable such carbocation (a tertiary one above). This of course follows the Markovnikov rule and not its negation. The overall reaction might be anti-Markovnikov but its mechanism is not! An updated interpretation (not for the faint hearted!) is nicely explained on this blog. This shows that the above “arrow pushing” mechanism, itself based on something called transition state theory, is in fact an over-simplification. Instead, it is necessary to resort to molecular dynamics rather than transition state theory to explain why the boron attaches to the least substituted carbon of the alkene. In step 3, this species is reacted with hydrogen peroxide. In step 4, a proton is transferred in the resulting peroxyalkylborane. Such a step, often simply labelled as PT, is regarded as a freely available equilibrium. In other words, one can move protons around a structure to where-ever is deemed as convenient for the next step (well, within reason). Step 5 is the key step, and to highlight this, I have shown the arrow pushing using red arrows. Overlap between the C-B donor and the O-O acceptor. Click for 3D. Note how the bonding part of the C-B bond (purple) overlaps with the blue of the O-O antibonding orbital, thus forming a new C-O bond. 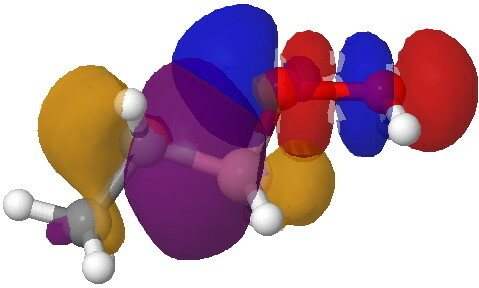 The (blue-red) node along the O-O leads to an entirely cleaved O-O bond, but you can see the genesis of a new B-O bond in the orange-red overlap. An intrinsic reaction coordinate computed for the reaction is shown below. Note how the evicted water molecule changes direction at the end and makes a bee-line for the boron atom. The end result of this reversal is of course boric acid. As often happens, it is worth taking a look at a tradition text-book mechanism to see what a modern slant might give it. POSTSCRIPT: You will notice from the comments on this post below, the observation that the hydroboration-oxidation reaction is normally carried out in basic solution. I have therefore repeated the calculations using a deprotonated starting point (ωB97XD/6-311+G(d,p)/SCRF=water) as shown below. This is best viewed as below, showing both the energy and the energy gradients as a function of the proceeding reaction. Note first the barrier to the migration, which is ~30 kcal/mol. This is because OH– is an inferior leaving group to H2O (for which the barrier is ~2 kcal/mol). This would make it a very slow reaction at room temperature. Notice how the first prominent action is a rotation of the OH group. At an IRC of +6, a second feature appears, which is the reversal of the trajectory of the evicted OH group in re-attaching itself to the boron (as before). As noted in the comments below, the kinetics are a balance between the slow reaction of a deprotonated species in high concentration, and the much faster reaction of a protonated species in lower concentration. This entry was posted on Sunday, February 26th, 2012 at 8:28 pm and is filed under Uncategorized. You can follow any responses to this entry through the RSS 2.0 feed. You can leave a response, or trackback from your own site. thanks for the interesting illustrations of basic reaction mechanisms, which I follow with interest. First, the statement that hydroboration is anti-Markovnikov may primarily come from the overall anti-Markovnikov water addition that a hydroboration/oxdation sequence mediates. On the other hand, the historical definition of Markovnikov states that: “the halide (X) of halide-hydrogen acids (HX) adds to the less hydrogenated carbon, i.e., the one which is more under the influence of other carbons” (doi:10.1002/jlac.18701530204, on page 256; HX and X is not used in the original). If you would consider the B-H bond as X-H, then hydroboration is indeed anti-Markovnikov; however, Markovnikov only inteded his rule to be valid for hydrogen halides. So it is not completely wrong to say hydroboration is anti-Markovnikov, at least according to the historical Markovnikov rule. Second, the borane oxidation is usually performed in NaOH (2 mol/L, if I remember correctly, pH >14) + H2O2 (pKa 12). Under those conditions, the hydroperoxide anion will attack the borane, and rearrangement is most probably taking place without protonation at the OH leaving group that you have used in your example. This might be one of the few reactions, where OH- is a leaving group (certainly assisted by general acid catalysis by H2O, or collapsing with the ROBH2 to a borate anion). Maybe the anionic version would be more difficult to calculate? Thanks again for the interesting illustrations to the basic mechanisms! Thaks Lukas. Yes, Markovnikov ‘s name is attached merely to an observation, and not an interpretation. I draw this out however so that students can work out what is happening based on (mechanistic) rules, rather than merely a memory of taught facts. Yes, hydroboration is done at high pH. But OH(-) is also a poor leaving group. Who knows if the reaction proceeds via a slow elimination of a poor leaving group, or much faster elimination from the (small) concentration of a protonated leaving group (actually the species is a zwitterion, and I did actually perform the calculation in a continuum water solvent). Actually, moving protons around, or adding/removing them does perplex many a student, and in fact we rarely have any experimental basis for what any particular “active” species might be. Again, I repeat, it may often be a balance between a slow reaction of a high concentration species, or a fast reaction of a low concentration species. I suspect questions such as this would need to be studied by dynamics rather than arrow pushing mechanism. My point really was that there is probably a limit to what one can do with transition state theory (and associated arrow pushing), which is how we currently teach organic chemistry. If one did try to model the anionic mechanism, as you suggest, then nowadays I am very committed to including the (Na?) counterion as well. We have always ignored such counter ions, and yet I feel they do have a major role to play. This in turn introduces a stochastic problem. Where do we put it? How do we solvate it. Should we have an ionic lattice instead? Things rapidly get very complicated! We do actually have a fascinating example of a simple introductory mechanism which can only be sensibly modelled with TWO counter ions included in the model, as well as one solvent molecule (acetonitrile). This is currently being written up for conventional publication. Replying first to Paul. I absolutely accept that the M rule is applied to the reaction and not the mechanism (of which M as we will refer to him knew nothing). For additions of HX (where X is more electronegative than H), the mechanism and its outcome both correspond to M’s rule. For reactions where X is more electropositive than H, the mechanism could still be said to follow a (modified) M rule, whilst its outcome does not. I make this distinction for pedagogic reasons; I find it easier to remember reactions by following rules! Replying to Lukas: I have added a postscript to my post in which a calculation for the deprotonated intermediate is reported. You will notice a very large barrier (~30 kcal/mol), which does not correspond to a thermally facile reaction. Of course, in reality one probably needs to handle the solvation correction more accurately (with explicit solvent molecules), but it is really anyone’s guess whether the dominant kinetic pathway is from a deprotonated species, or from a very rapid expulsion from the (low concentration) protonated species. I do not suppose the answer to this is known from experiment? 1. The historical rule is clearly restricted to HX = hydrogen halides and their additions to alkenes. 2. Markovnikov’s rule was not necessarily influential in its original form. The rule was not even mentioned in an obituary of him in 1905. For a discussion of the history of the rule, see: P. Hughes, J. Chem. Educ. 2006, 83, 1152. 3. The formulation of the rule as “the rich get richer” (H adds to the carbon bearing more hydrogens) is a derivative formulation which is relatively obvious and may have been introduced already by early textbook authors with a biblical background. 4. However, here is the big problem: In terms of education, teaching Markovnikov’s rule in its original formulation ALONE would not be justified at all. Modern teaching should point out the electronic effects behind the empirical observation. Students will be served better by applying the carbenium ion stability criterions in order to predict regioselectivities of electrophilic additions of HX to alkenes. Anyway, this was the opinion of my teachers who preferred a mechanism-based teaching, and I continue in a similar vein. In short: the authors measured kinetics of boronic acid (phenyl, butyl, and others) oxidation with H2O2 over a range of pH (or H0) of ca -4 to +6 and found a minimum of rate at pH ca 3. In acidic medium, the mechanism which Henry calculated was proposed to take place. In basic medium, the mechanism with OH- as leaving group was assumed. Note that measurements at pH 12 or higher (typical for preparative applications) have not been carried out. I would guess that in basic solution the OH- leaving group mechanism is dominant, but then again, the above are only interpretations of kinetic data. The kinetic data itself does not say anything about structure, and maybe alternative explanations cannot be excluded. For another example of this effect (a fast reaction from a species of low concentration, or a slow reaction from a species in higher concentration) take a look at the cyanohydrin reaction. The reaction between KCN and acetone takes place using “40% sulfuric acid”, ie at a pH of less than 0. The pKa of HCN is around 9, which suggests that the concentration of cyanide anion is exceedingly low. And yet all mechanisms for this reaction are shown as proceeding via this anion. This probably because the product is a cyanohydrin, and not an isocyanohydrin, and so the nucleophile must be the C of CN. One can only generate a lone pair of electrons on the carbon if the cyan group is ionised as CN(-). The protonated form, HCN, has only a covalent electron pair in a H-C bond, and such a bound pair is not known for its nucleophilicity. I do suggest possibilities in my post on the topic, but discussion here is always welcome! I have calculated the free energy of activation for the anionic reaction, in which the departing HO– anion is itself solvated with two explicit water molecules (the whole being embedded in a continuum water solvent) It comes out at 19.0 kcal/mol (wB97XD/6-311+D(d,p)/scrf=water), which is a facile thermal reaction at around room temperatures. The transition state is archived at 10042/to-12937. The lesson perhaps is that OH– should not be modelled in isolation, but as OH–.2H2O. We might conclude that this really is the likely mechanism for the final step of this reaction. The hydroboration-oxidation mechanism: An updated look. is licensed by Henry Rzepa under a Creative Commons Attribution-Noncommercial-Share Alike 3.0 United States License.